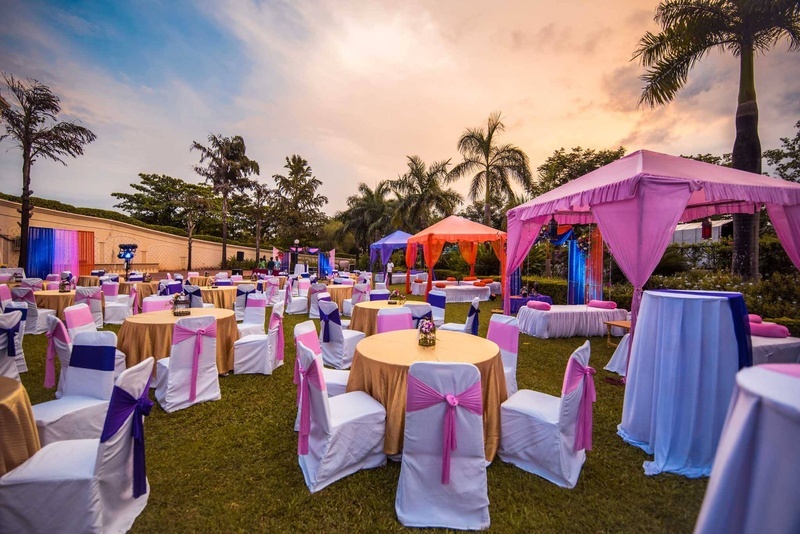 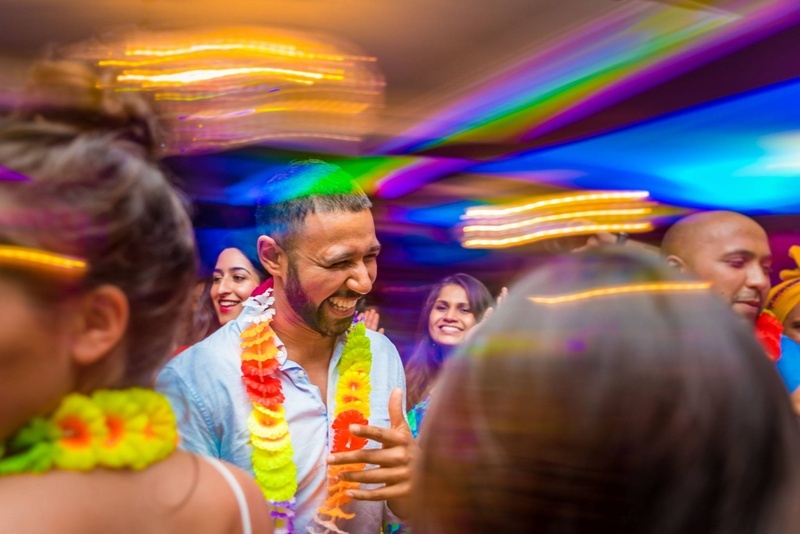 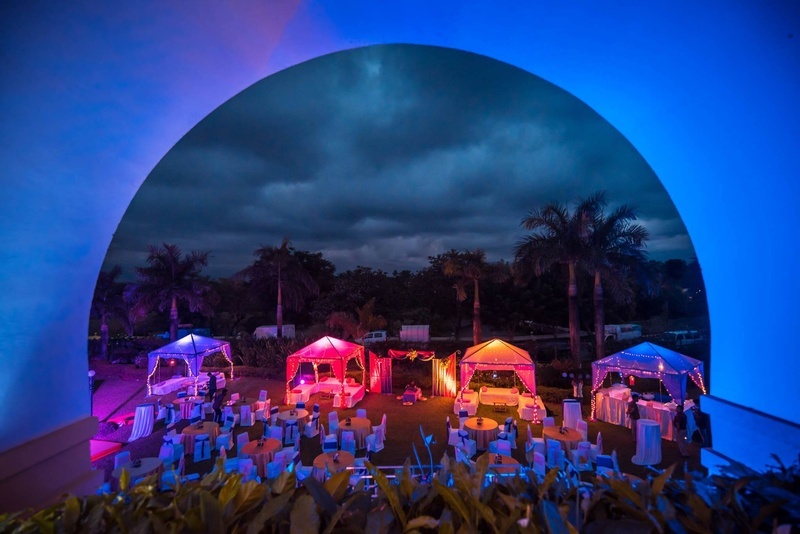 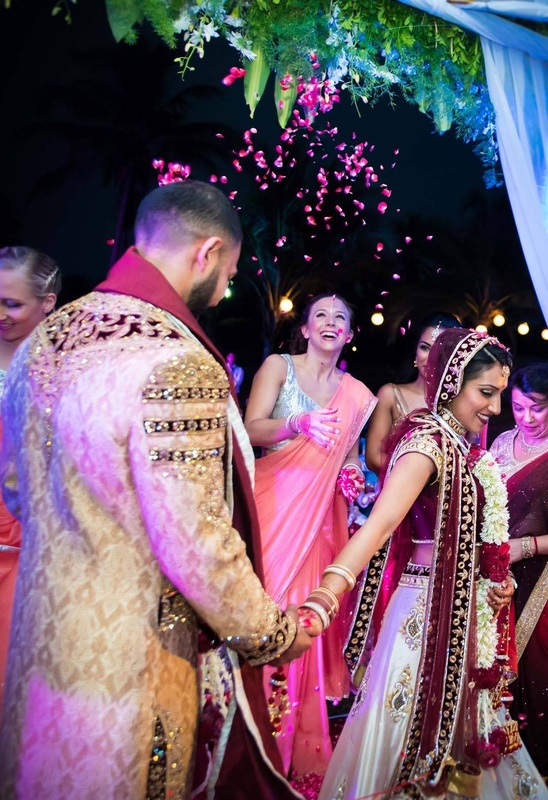 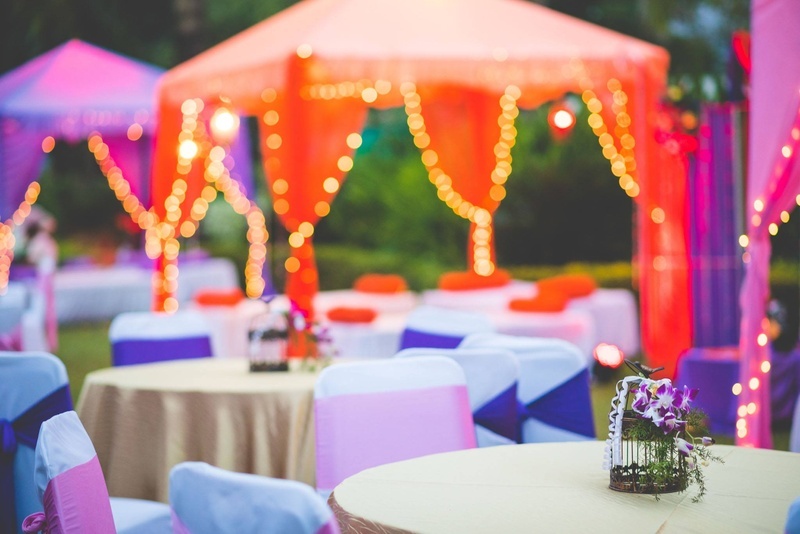 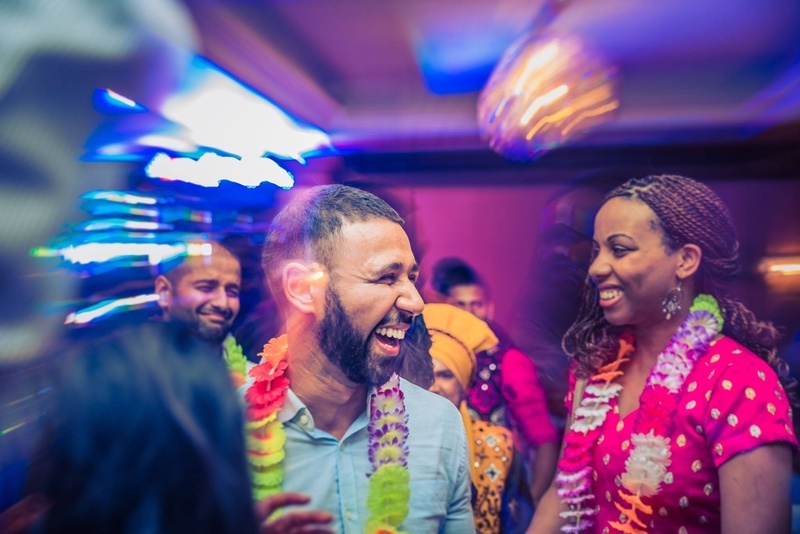 Dusky skies, palm trees, tangerine and aubergine drapes fluttering in the sea breeze, festive fairy lights coupled with lots and lots of singing, dancing and merrymaking at a Goa resort marked the beginning of Daisy and Rakesh’s wedding festivities. 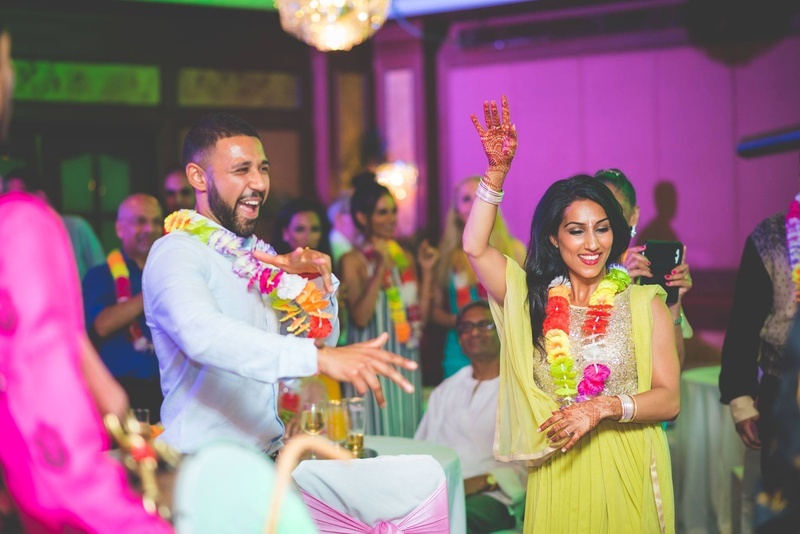 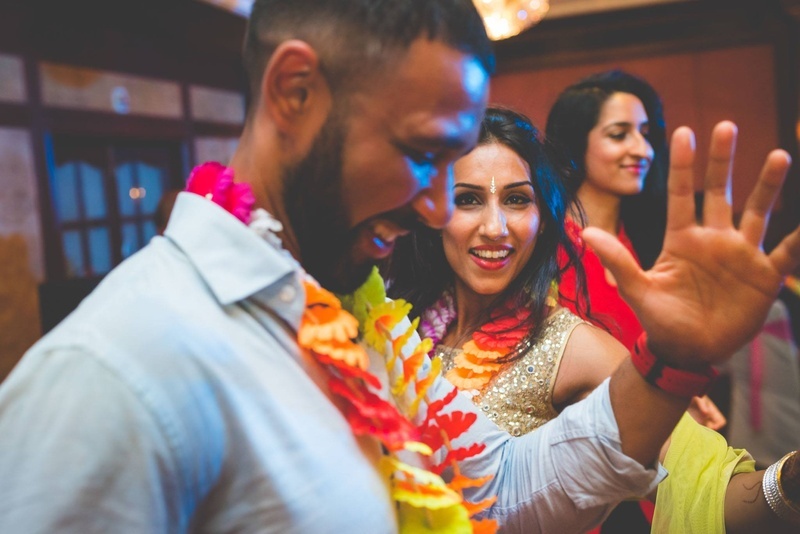 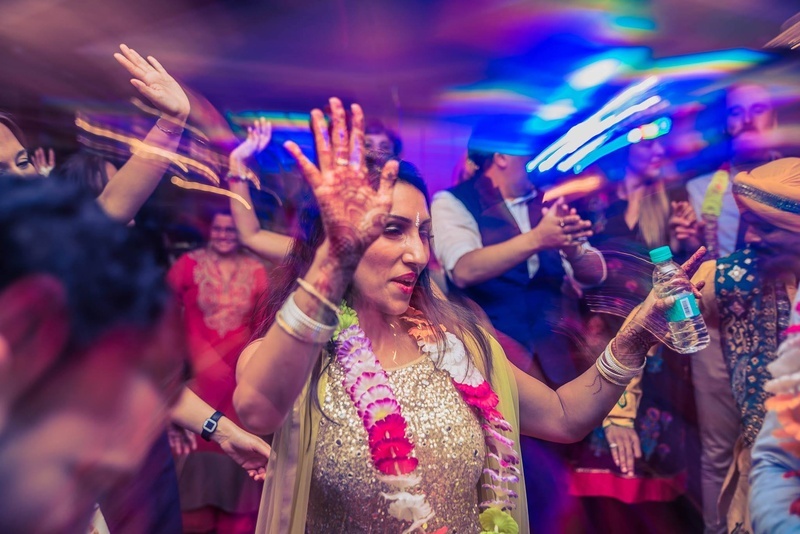 Their sangeet ceremony was a riot of colors and unadulterated fun. 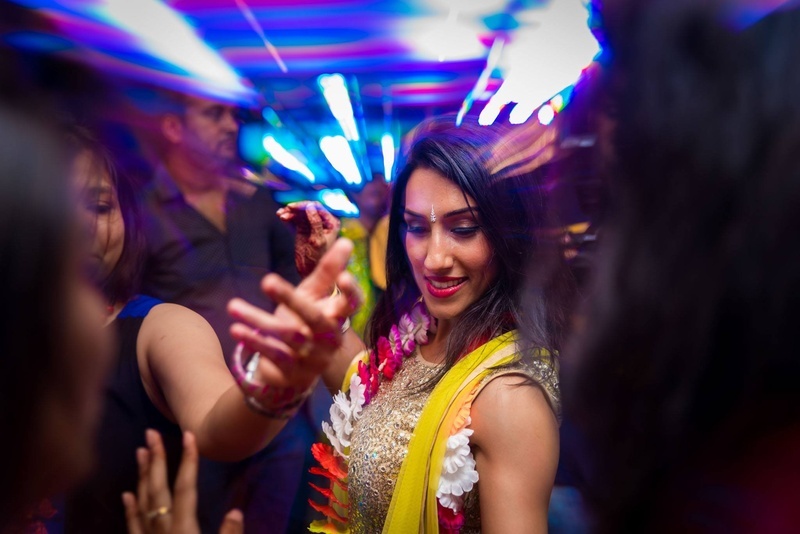 Daisy glittered in a gold sequined blouse and lemon yellow saree. 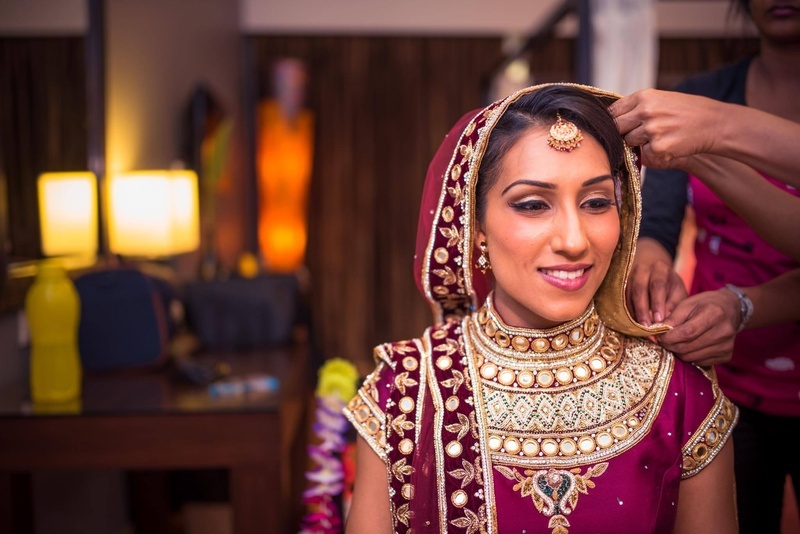 She kept her jewellery minimal. 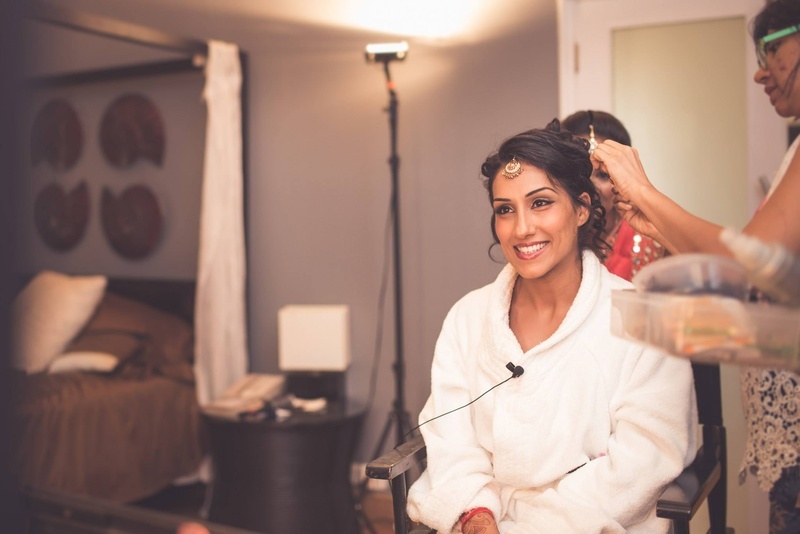 This is one bride who chose right. 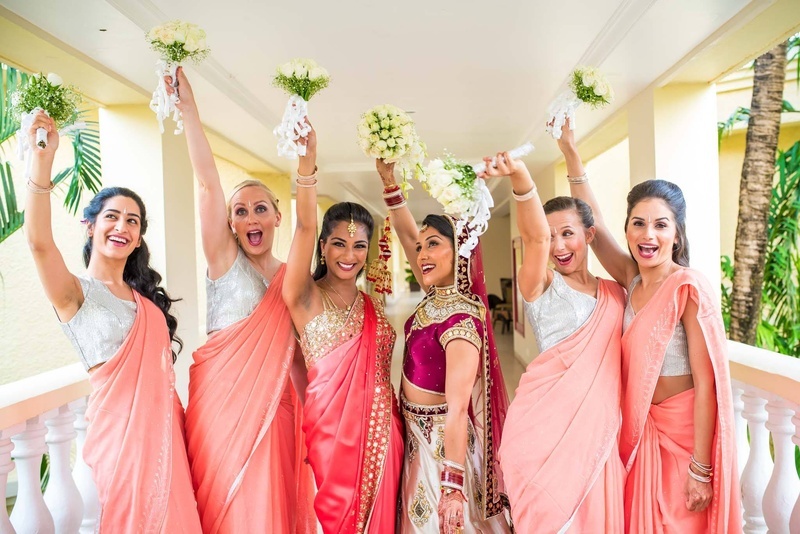 Why be encumbered by heavy duty bridal wear when you can look just as striking in something simple and end up having as much fun as the guests. 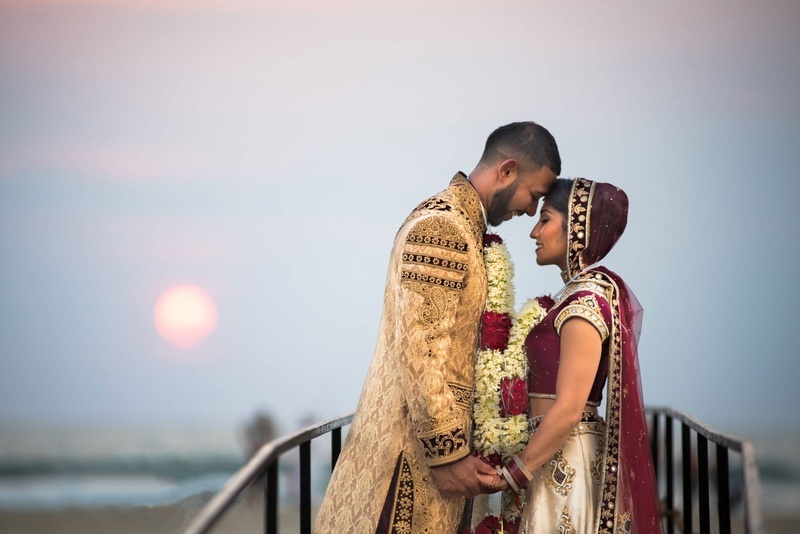 WhatKnot Photography masterminded a shoot with incredible attention to detail and churned out an album as varied in emotion as the technique and style of photography utilized. 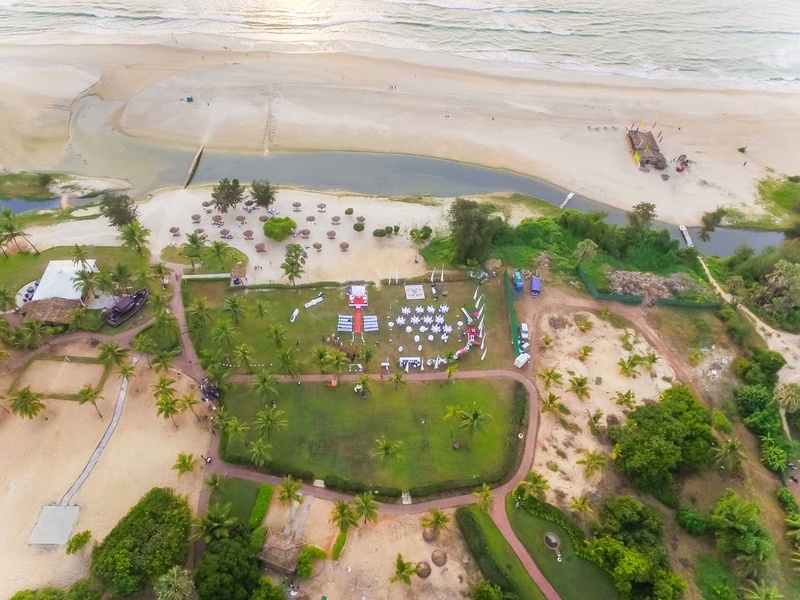 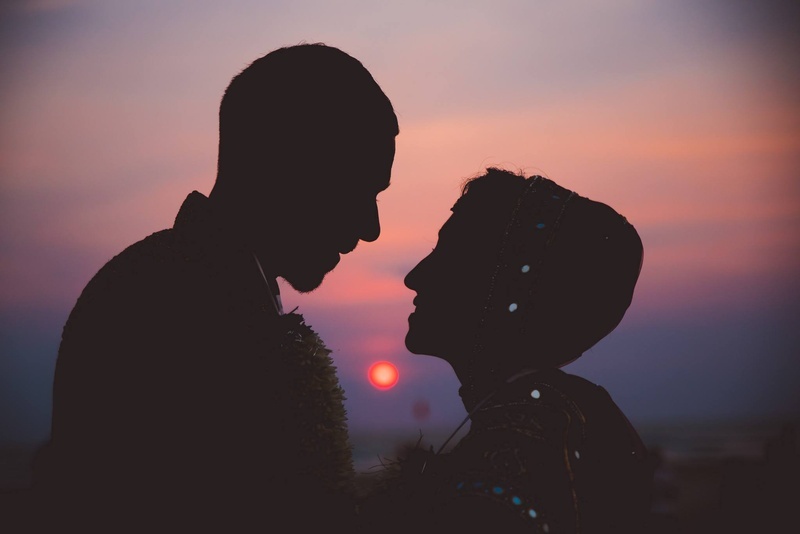 Close ups, long shots, bridal portraits, candid moments, aerial shots using drone photography, silhouetted post wedding shoot of the couple against a dusky tangerine and purple sky, lit up by rays of the setting sun are some noteworthy moments. 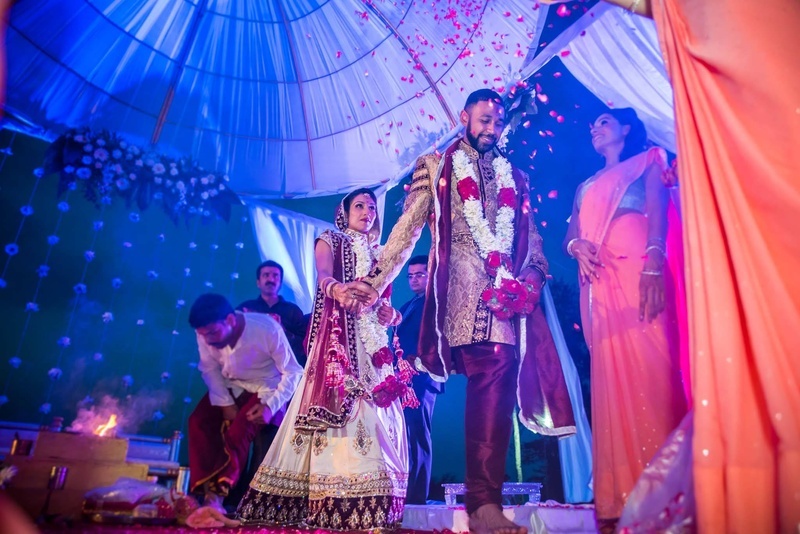 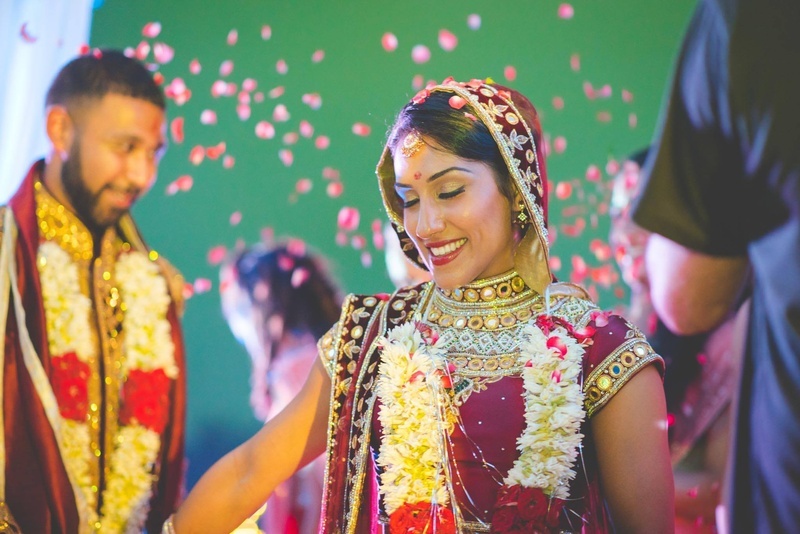 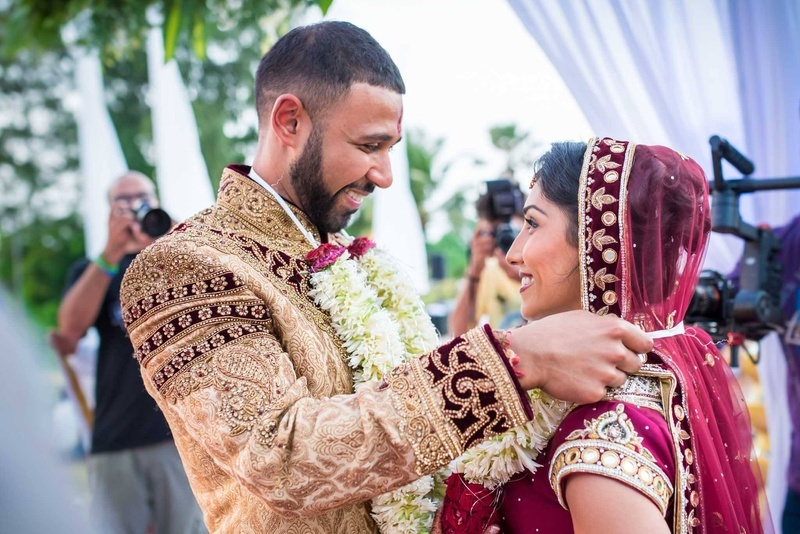 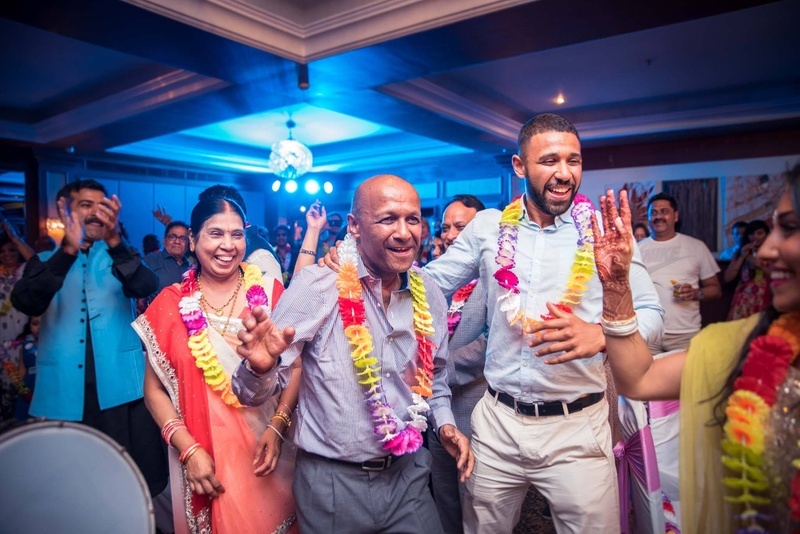 Several endearing western wedding traditions made their way into Daisy and Rakesh’s Indian wedding ceremony. 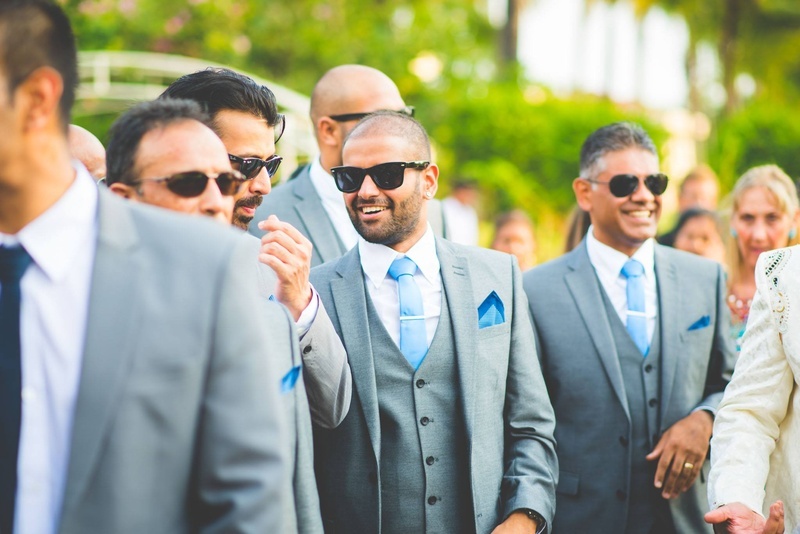 The bridesmaids and the groomsmen in coordinated outfits and the bride’s floral bouquet were a great addition. 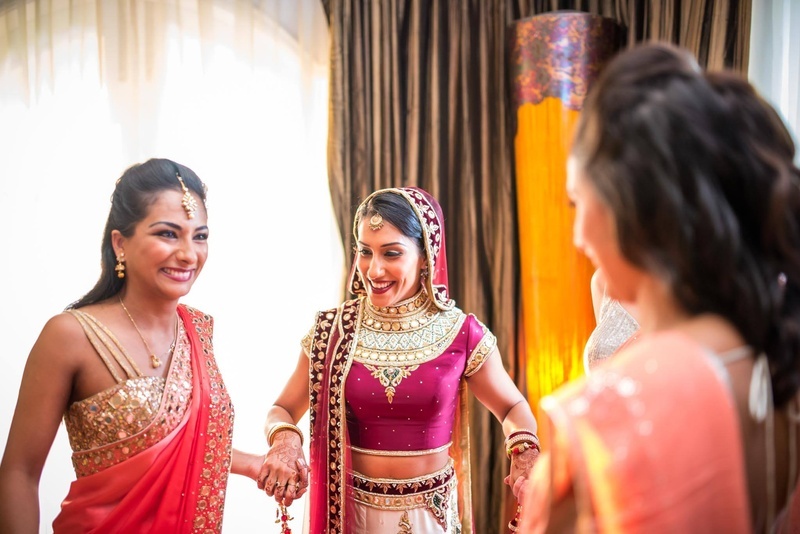 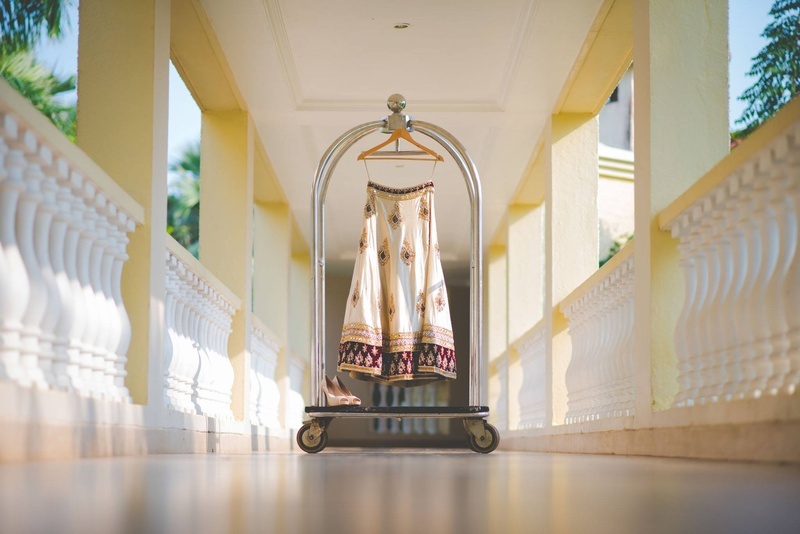 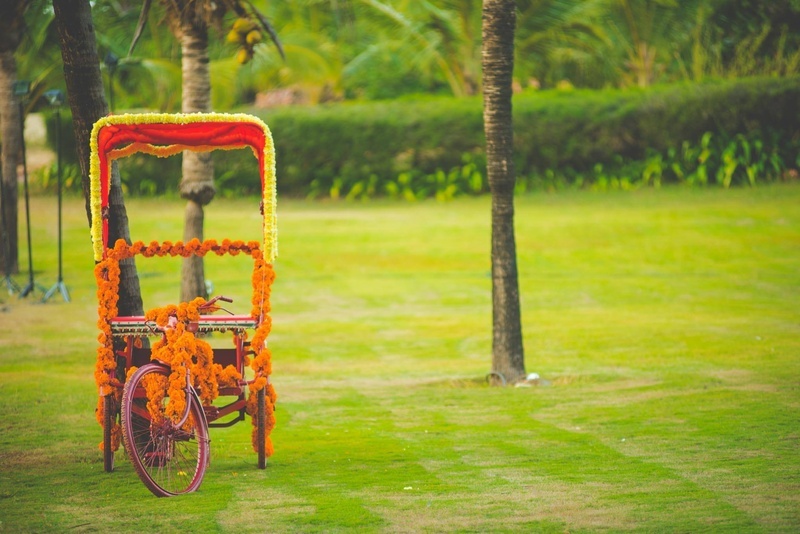 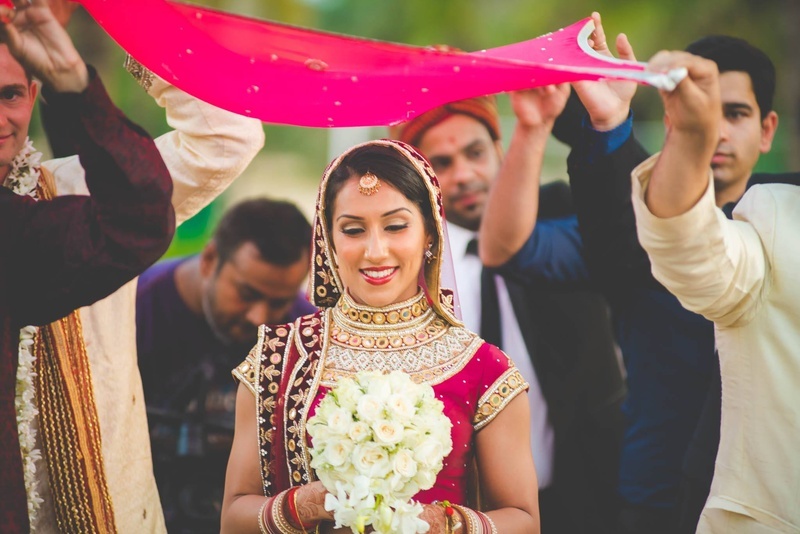 And now let’s Segway into what grabs the most eyeballs at the wedding – aka the bride and her wedding lehenga. 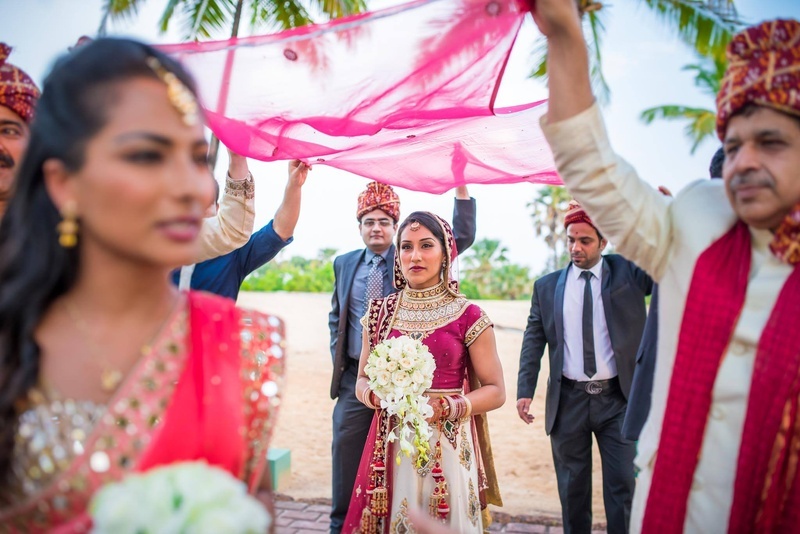 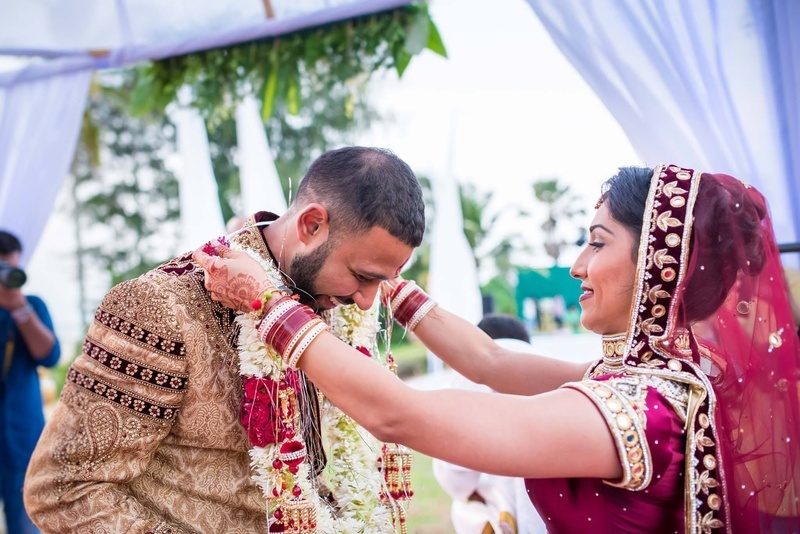 Daisy’s off white and maroon bridal lehenga was a perfect selection for a destination wedding. 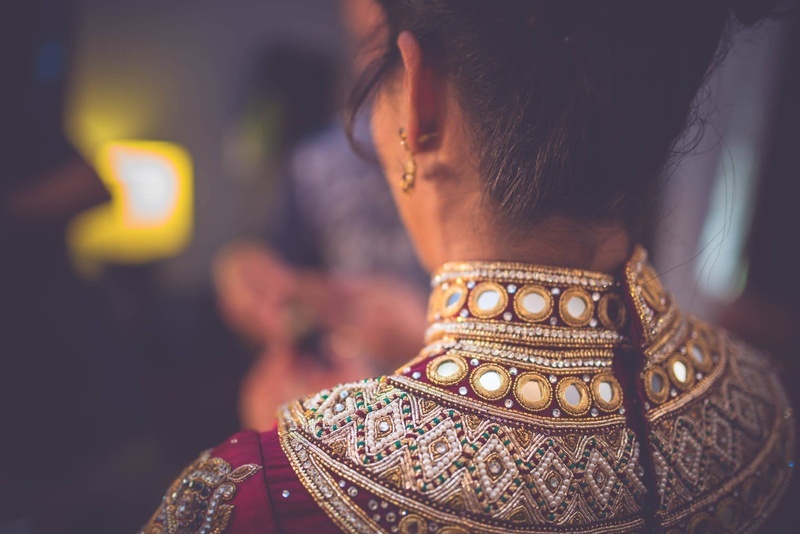 This arresting ensemble had a heavily embellished wine colored, high neck blouse with thread work and mirror work details. 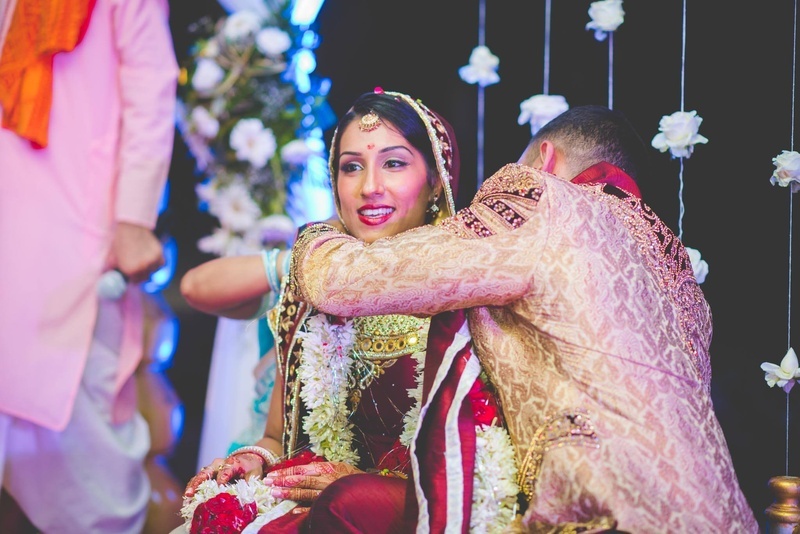 The mushroom lehenga was lighter in comparison with spread out thread work butis, and a heavy border. 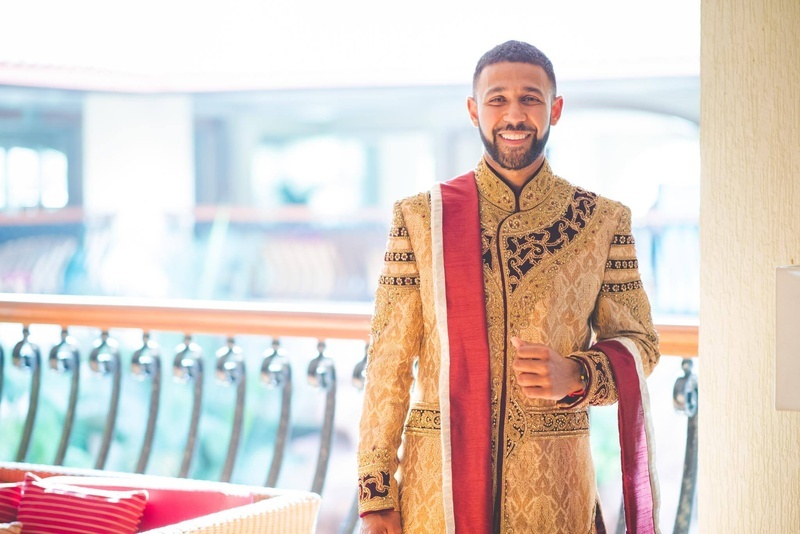 Rakesh looked dapper in a coordinated brocade sherwani with maroon detailing and thread work. 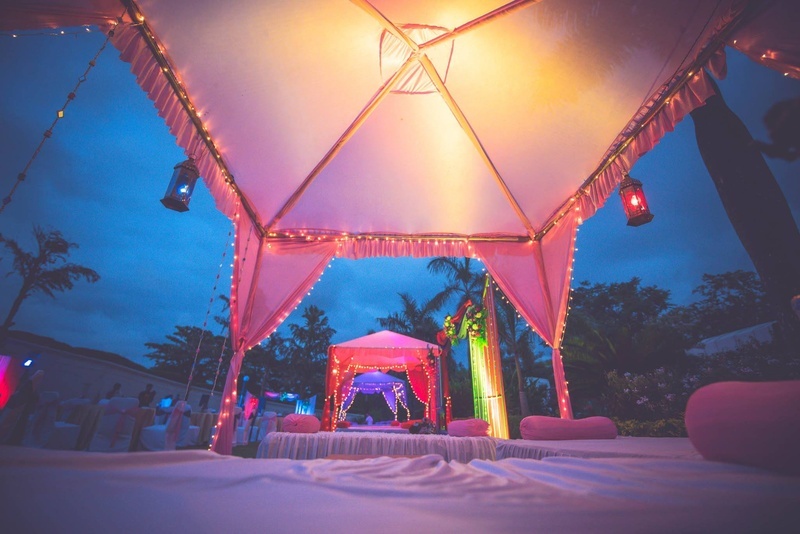 The gorgeous, lit up white cabanas and round table seating on the beach looked surreal as a backdrop for this beautiful wedding.